It’s a fig leaf, dear readers! And can you guess where it came from? That’s right! 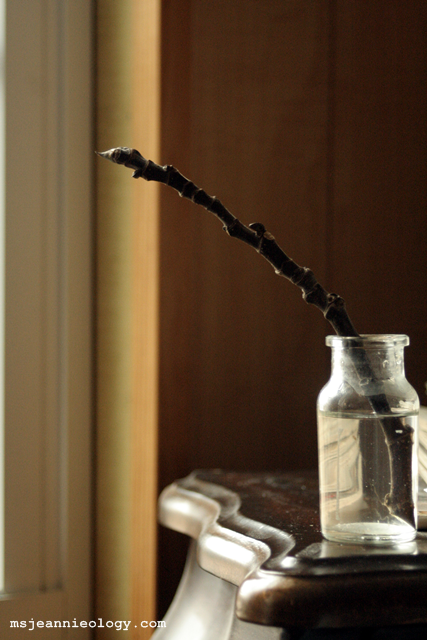 It came from our very own fig clipping water method! 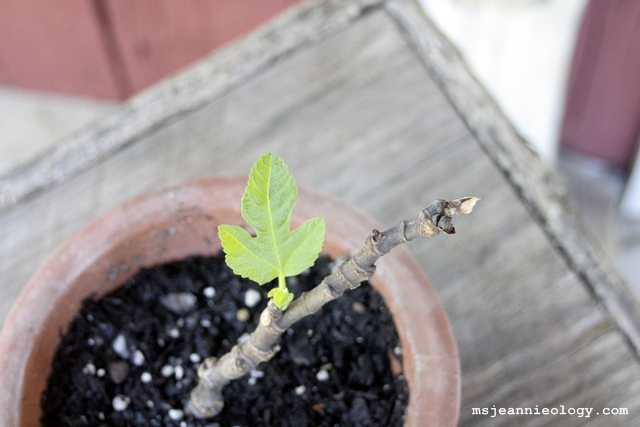 It’s hard to believe that this was the easiest most uncomplicated way to grow a fig tree. 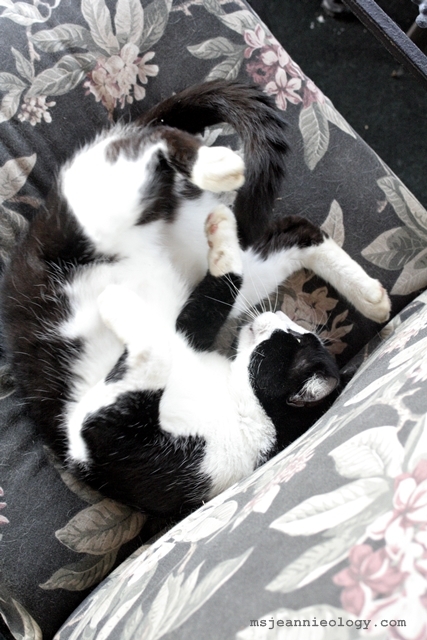 And yet, here our little dazzler is – her own version of jazz hands greeting the day. 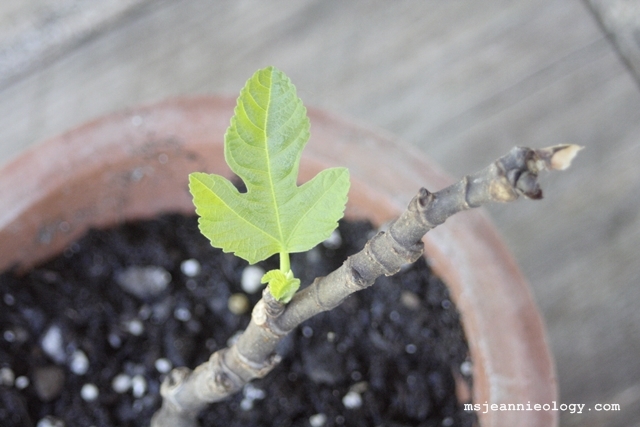 If you recall from previous posts, Ms. Jeannie tried two different ways to grow a fig tree from a clipping. There was the newspaper method and the water method. After trial and error, which you can catch up on here, the clear winner was the water method. 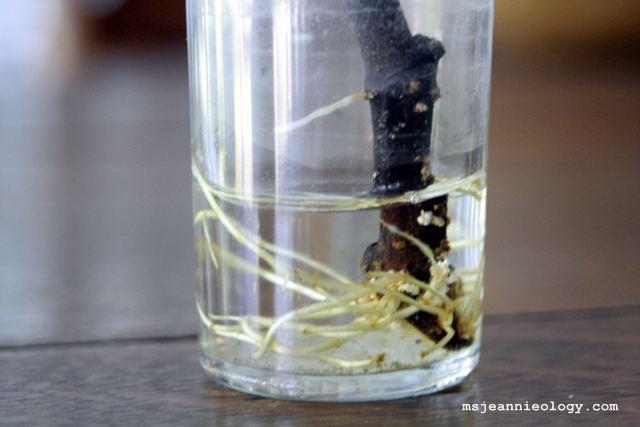 In a nutshell… cut a fig clipping in winter, stick it in a jar of water for several months and watch the roots grow. Then transfer the rooty clipping to a pot filled with potting soil. 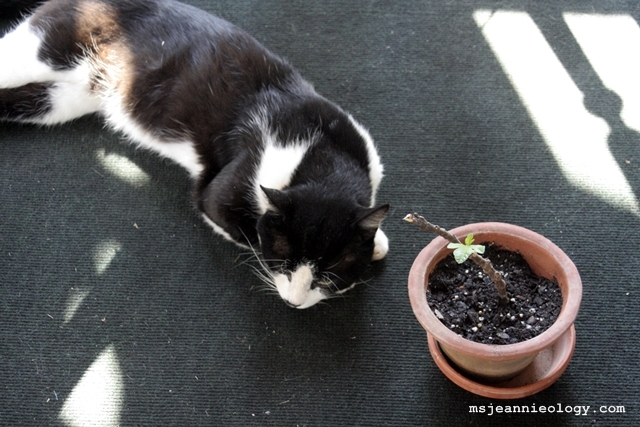 Ms. Jeannie at this point still kept the clipping indoors for a couple of weeks, but placed it next to a window that receives indirect sunlight. 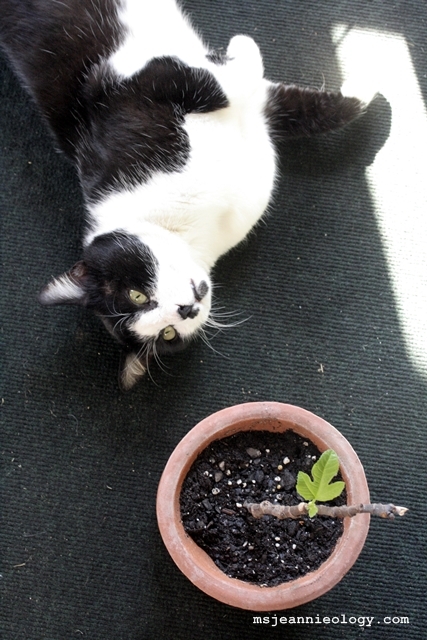 Then, on a bit of a whim one gorgeous afternoon, she moved the pot to the screened-in porch. That side of the house gets late afternoon sun for a few hours and apparently that was the ticket for this little one to sprout! And so here we are, in newborn fig heaven. 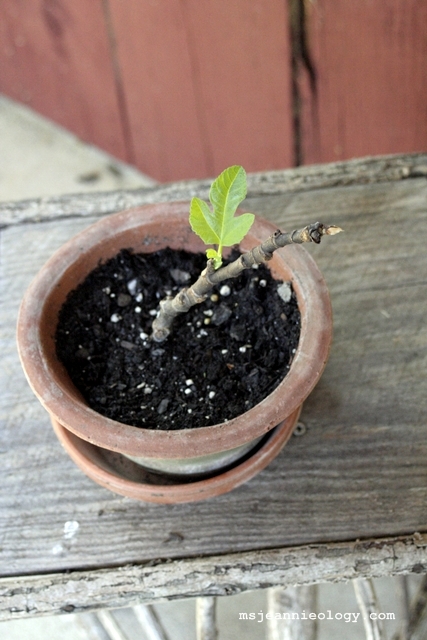 When this little darling sprouts a few more leaves, she’ll transfer it to a bigger pot. In the meantime, she’ll just watch it grow. 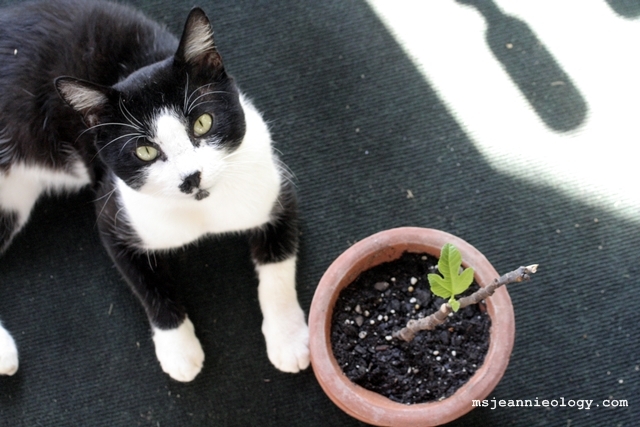 Just like the kitty that surprised Ms. Jeannie in the fig bush last year – this visitor also found his way into the yard from the fig bushes. Perhaps there is some sort of trap door in those fig bushes! 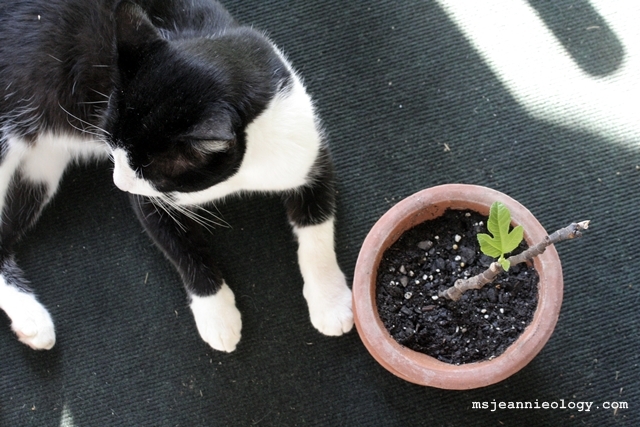 A little underground network of tunnels for stray cats, with a special sign at Ms. Jeannie’s fig roots that reads REST STOP – THIS WAY! Whatever the case – it seems Ms. Jeannie is on some sort of list now to receive a new cat every summer. This one she has named Boy-O because he’s very clearly a chap, and he’s got green eyes and that handsome black and white coat which favors the Irish complexion. Ms. Jeannie actually went through a whole roster of names beginning in Italy (since he was in the figs on a hot summer afternoon of course!) … there was Paolo, Giuseppe, Jono. He was completely indifferent to those names so Ms. Jeannie changed directions… Adolph, George (this was long before the royal baby! ), Leo, Sam, Charlie. No interest again. Then she said in exasperation – “Boy Cat what is your name? !” And he turned his head and looked at her. Aha! Something was ringing a bell. “Boy. Boy Cat. Boy-O? Could that be it? Boy-O?” Immediately right after she posed this question, he meowed. Clearly there was a winner in the name department! 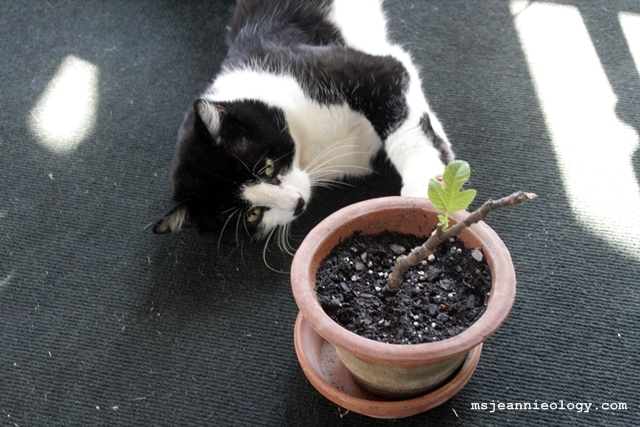 All this afternoon bonding time with the fig sprout has led Ms. Jeannie to think that perhaps Boy-O is a fig nanny. Maybe that sign in the underground tunnel reads FIG NANNIES – APPLY HERE, and Boy-O just showed up because he needed a job. Fig nannies just don’t come along every day, dear readers, so if you know of anyone – who might need such a talent, than Boy-O is their man(cat). 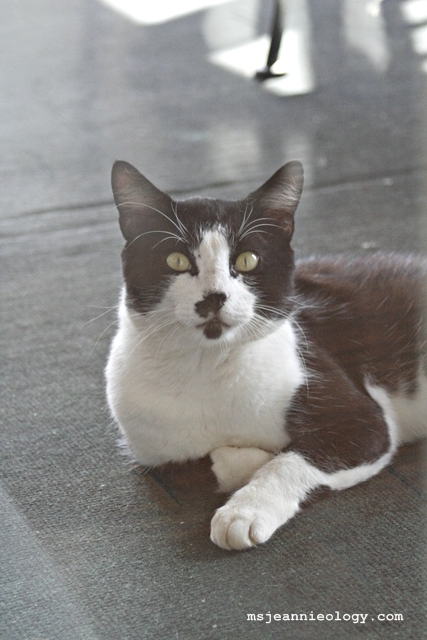 What a great-looking cat–he’s lucky to have chosen your house to visit! And the fig is very impressive, too! So cute….I love the way you find everyday events and turn them into something special – the rest of us just pass so many things by and just keep rushing around missing out on these small little miracles! Oh thank you! It is a wonderous world that we live in! all caps, had to do it. seriously, lady Ology. what a perfect post.